Wall and car adapters for standard USB Practical, compact wall plug adapter for CORE rechargeable battery charger for the house or the car. Easy charging with cigarette lighter (integrated battery full indicator). 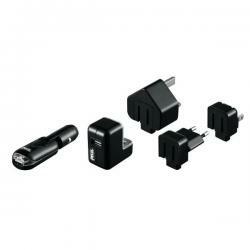 Sold with interchangeable adapters for Europe, North America and the United Kingdom. 3 year guarantee against material and manufacturing defects.